Welcome to the SBC Awards 2017 submission page! 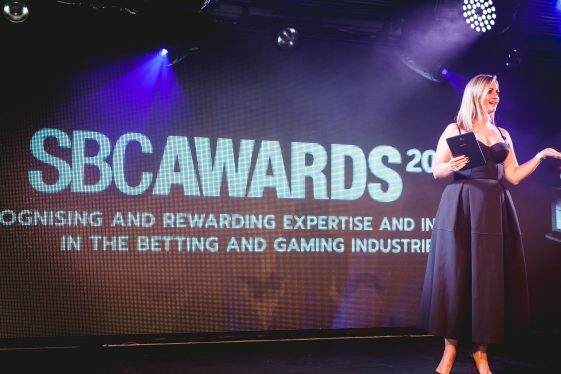 After the feedback we received from last year’s successful awards event at Chelsea’s Under the Bridge nightclub, we have made some tweaks to the format this year to make things more accessible for the whole sports betting sector. On this page you are invited to nominate your company for one of the 28 exciting categories, which have been split into Operator/Affiliate and Supplier awards. These awards cover the period between 1 August 2016 and 31 July 2017. SUBMIT YOUR ENTRY NOW for a chance to win one of the coveted awards in front of an expected 500+ senior attendees from the industry. The Operator/Affiliate Awards have been designed with operators and affiliates in mind. The operator & affiliate categories are voted for by the attendees of this year’s Betting on Football and Betting on Sports Conferences. Industry suppliers and agencies are invited to apply for our Supplier Awards, either on their own or with a partner. The winners of the supplier categories are decided by our expert panel of judges. Companies may apply in more than one category. This award has been created to recognise the best overall bookmaker of 2017. The category will be awarded to the bookmaker that has been the most innovative and successful in its activities in 2017. Particular emphasis will be placed on growth, new market penetration, quality, differentiation of operations and strength of brand. This award has been created to recognise the most impressive emerging company in sports betting 2017. The category will be awarded to the company that has emerged most successfully as a new player in the industry over the last three years. Particular emphasis will be placed on growth, new market penetration and improvements in brand awareness and brand recognition. This award has been created to recognise the best football bookmaker of 2017. The category will be awarded to the bookmaker that has been the most innovative and successful in its activities in 2017 around the sport of football. Particular emphasis will be placed on growth, new market penetration, quality and differentiation of operations and interaction with the sport of football. A new award created to recognise the best racing bookmaker of 2017. The category will be awarded to the bookmaker that has been the most innovative and successful in its activities in 2017 with regards to horseracing. Particular emphasis will be placed on growth, new market penetration, quality and differentiation of operations and interaction with the sport of racing. A return of an award that has been created to recognise the best mobile bookmaker of 2017. The category will be awarded to the bookmaker that has been the most innovative and successful in its activities in 2017 via the mobile channel. Particular emphasis will be placed on growth, quality and differentiation of operations and customer experience. A new award created to recognise achievements in the battle against problem gambling. The category will be awarded to the bookmaker that has been the most proactive and successful in its socially responsible activities in 2017. Particular emphasis will be placed on training, awareness campaigns and fundraising. This award has been created to recognise the best Esports Bookmaker of 2017. The category will be awarded to the bookmaker that has been the most innovative and successful in its activities in 2017 in esports markets. Particular emphasis will be placed on market penetration, communication and overall quality of product and brand. This award recognises the company(ies) behind the most innovative, intelligent and creative Marketing Campaign of 2017. Award is open to operator/affiliate or agency working on behalf of an operator/affiliate. Particular emphasis will be placed on the creativity, success and originality of the campaign. This award has recognises the best overall sports betting affiliate of 2017. The category will be awarded to the affiliate that has been the most innovative and successful in its activities in 2017. Particular emphasis will be placed on quality and scale of traffic generated, overall growth, differentiation and innovation. This award recognises the best product innovation in the sports betting affiliate sector. The category will be awarded to the affiliate that has created the most innovative and successful affiliate product in 2017. Particular emphasis will be placed on market penetration, growth, differentiation and innovation. This new award has been created to recognise the best affiliate partner scheme of 2017. The category will be awarded to the operator that has developed and offered the most popular and successful affiliate scheme this year. Particular emphasis will be placed on popularity, overall growth, differentiation, customer service and relationship management. This award has been created to recognise the best white label suppliers of 2017. Candidates should be as candid as possible in sharing KPIs and metrics without breaching any data. Particular emphasis will be placed on the success, scale, stability, flexibility and geographical reach. This award has been created to recognise the company providing the best sportsbook product in 2017. Particular emphasis will be placed on the creativity, differentiation, commercial success and impact of the innovation. This award has been created to recognise the best standalone platform provider of 2017, servicing the sports betting industry. Candidates should be as candid as possible in sharing KPIs and metrics without breaching any data . Particular emphasis will be placed on the success, stability, flexibility and geographical reach. This award has been created to recognise the company providing the best marketing service of 2017. Particular emphasis will be placed on the creativity, differentiation, commercial success and campaign reach. This award has been created to recognise the best esports betting product suppliers of 2017. Candidates should be as candid as possible in sharing KPIs and metrics without exposing any sensitive data. Particular emphasis will be placed on the success, scale, stability, flexibility and geographical reach. This award has been created to recognise the new company or companies behind the best innovation in sports betting software in 2017. This award has been created to recognise the company behind the best live betting product of 2017. Particular emphasis will be placed on the range of markets/sports, stability, commercial success, UX and innovation. This award has been created to recognise the company providing the best streaming product to the betting market in 2017. Particular emphasis will be placed on the latency, user experience, range of sports and commercial success. This award has been created to recognise the organisations (sports clubs, agencies, operators) behind the best sports sponsorship partnership of 2017. Particular emphasis will be placed on scale, creativity, differentiation, commercial success and innovation. This award has been created to recognise the company supplying the best sports data product in 2017. Particular emphasis will be placed on the speed, accuracy, scale, flexibility and robustness. This award has been created to recognise the company behind the best payment product of 2017. Particular emphasis will be placed on customer experience, commercial success, security and geographical range. This award has been created to recognise the company behind the best Retail Betting product of 2017. This can be anything from machines to displays to screen systems – anything that adds to the bottom line in a retail environment. Particular emphasis will be placed on the customer engagement, differentiation, commercial success and impact. This award has been created to recognise the company behind the best virtual football product of 2017. Particular emphasis will be placed on the creativity, commercial success, geographical range, user experience and innovation. This award has been created to recognise the company behind the best virtual sports product (non football) of 2017. This award has been created to recognise the company behind the best DFS product of 2017. Particular emphasis will be placed on the success, market penetration, user engagement and impact of the product. This award has been created to recognise the company providing the best service across multiple channels. Particular emphasis will be placed on the robustness, connectivity, complexity, commercial success and flexibility. This award has been created to recognise the company behind the best game or slot using a sports theme for 2017. Particular emphasis will be placed on the creativity, differentiation, commercial success and graphical design.